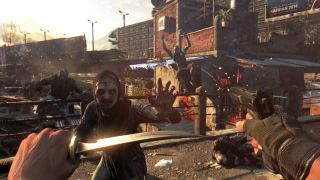 The new Dying Light "Test Your Survival Skills" trailer is a Choose Your Own Adventure-style journey through a mission to restore communications with a radio antenna surrounded by the undead. At various points in the video you'll pick between two options—left or right, in or out, dodge or clobber, that sort of thing—until you've made it (or not) to your goal. If the trailer rings a bell of familiarity, it's likely because of last year's interactive Edyn's Escape trailer for Hellraid, which also happens to be a Techland game. The Dying Light video seems a little less inclined to drop the hammer of random death, although I suppose it's possible that I made it from start to finish on my first try through the virtue of sheer luck. Not that it really matters: Like the great CYOA books of old, it's easy enough to rewind and try again if you blow it. More to the point, do you like what you see?